Comfort Suites, Hood River, Ore. 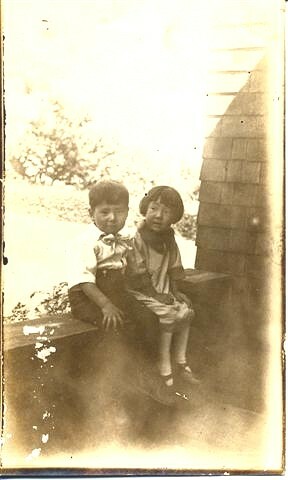 This is Frank Hachiya and Dorothy as kids sitting at the edge of the Rodamers' house entry. Apparently, the front of the Rodamer house in Oak Grove was very photographable or prominent at the time. A lot of photos have the entry as a backdrop. You'll have to guess as to how old they are. Three or four? I guess Frank must have been a little older than Dorothy. I would also guess that Mr. Hachiya really must have been taken when Donna was born. His memorabilia also includes one of him holding Donna when she was about a year old or even younger. reason Paul and Claude could never eat veal. Do you remember our e-mailing about our Guernsey cow and heifer? Especially that bit about how Paul and I are still unable to eat veal? That calf in the background is what we were talking about. It was my job mostly to look out for that calf especially when it was very young. Paul and I taught it how to drink milk from a bucket so it would not hang around its mother. It's a pretty good size in the photo. I guess that is about when we tried riding it. He got even bigger and started getting a set of horns. That's when Pop decided it was time. How can you eat a pet? 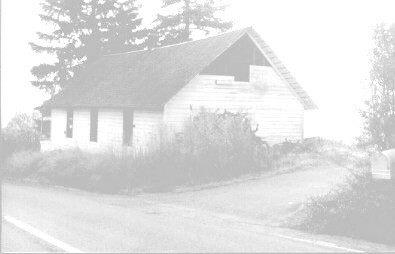 What remains of the family farm in Hood River, Ore.
At 17, Mototsugu Morita entered the United States at Seattle on the Inaba Maru on Feb. 2, 1911. At 19, Masano Sakakiyama entered the United States at Seattle on the Arabia Maru on Aug. 1919. Kashichi Morita at age 28 entered the United States on Dec. 28, 1903. He was born Kashichi Terada (changing his name to Morita when he married). 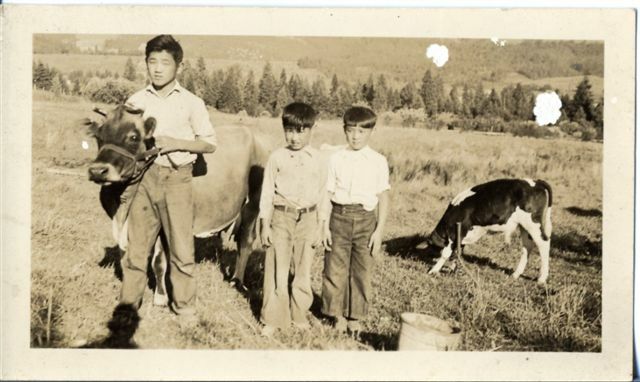 Kashichi Morita settled in Hood River, where he operated a tofu-making business, and son Mototsugu joined him there. Dad worked on the railroad with grandpa. He had received some personal tutoring from a young German lady. Dads English was better than the average Isseis. He was always studying. He communicated well with his neighbors and friends. He had a good sense of humor and was very well liked. I remember his little errands to the neighbors or friends always became very lengthy. I used to have to sit in the car for long periods waiting for him to emerge from the doorway. The family visit to the Nishimotos (ex-neighbors) was full of meaning. We saw Koe's presence in a lot of exchanges that actually took place between Lil, Rick, Kathy and everyone there. 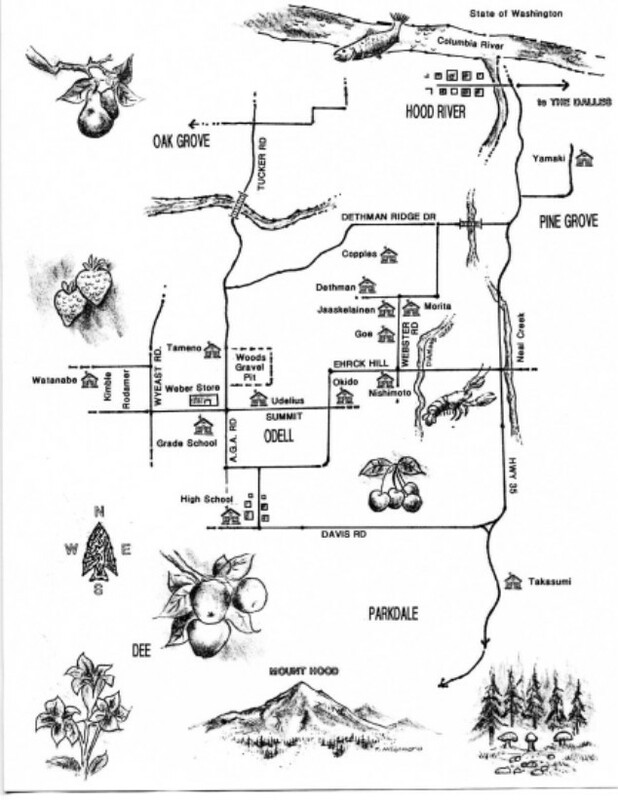 When Lil said those three pear trees behind the house (on the short cut over butte) were more than 60 years old, it was as if Koe was talking through Lil. Not to mention the fact that there is in existence pear trees whose growth extends 60 plus years. She and Rick have that same caring attitude that Koe had. Rick explains the orchard in exactly the same way Koe did, simply, no fancy appraisals, and only a smidgin of pride. Rick recommended fishing in Lost Lake over the closer reservoir "because it is more beautiful." So I went on instincts. That drive out there and catching a "good size" trout (Kathy's description) on the first cast in the presence of Mount Hood is unforgettable. We did not run out of gas even though I thought for a few moments that I might have. The drive along the floor of the Gorge as it accompanies the Columbia River toward Portland is as awe-inspiring and beautiful as it was in the 1930s. In the year 2000, it requires a detour off Route 84, the freeway, to really appreciate the grandeurs of nature. The section between Bridal Veils Falls, especially Shepperds Dell and Crown Point is exactly what I remembered. It is as narrow as I had visualized, without guardrails, with trees, leaves and moss, and a reminder of the dangers that Paul and Pop overcame with that rickety old Model A Ford truck and tons of apples.